Homeowners should request Bora-Care for the termite pretreatment of their new homes. Bora-Care replaces old-style soil termiticides which are pumped into the ground under and around the house. Liquid termiticides can break down in just a few years . 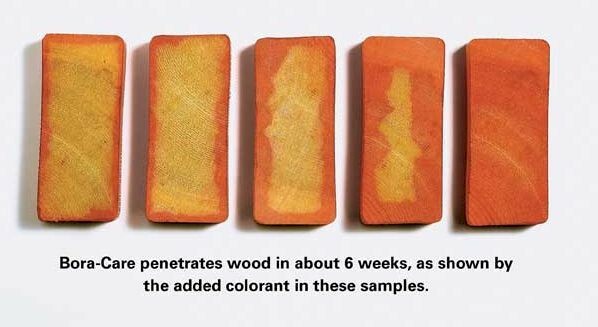 Bora-Care eliminates treated wood as a food source for termites. And studies show that termites can’t tube over Bora-Care treated wood. The active ingredient in Bora-Care is a borate salt. Borate salts work by taking advantage of a unique feature in the biology of termites, ants and other insects. If ingested by ants, beetles or termites, the insect becomes unable to extract nutrition from its food and starves to death. And because of this unique mode of action, insects cannot develop a resistance, ever. Bora-Care works differently than most other insecticides, termiticides and even other borate products on the market today. For starters, it isn’t applied to the soil but to the structure itself. Secondly, it isn’t just a repellent or a bait but a little bit of each. Bora-Care’s unique patented blend of glycols in combination with a borate salt provides results that are hard to beat. As soon as beetles and ants attempt to consume treated wood they die. Subterranean termites won’t even try to eat treated wood and if they attempt to build a tube on treated wood, the termites start to die. This alerts the termite colony and they abandon the wood.